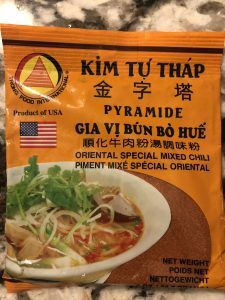 1 package of the bun bo hue spice package or you can use the can ..which you can get it HERE. This is the package that I used. 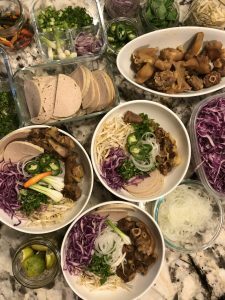 ***basically you can add anything you like on top of your BUN BO HUE. 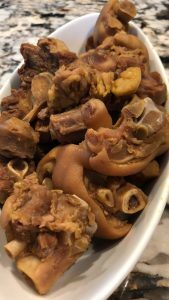 Clean the meat: Add all meat to a stock pot and enough water to submerge it, bring to a boil for about 10 minutes. Then drain and rinse thoroughly under running water to clear out all the impurity. If you are using the same stockpot. Wash the pot really well because usually all the impurity is stuck to the side and bottom of the pot. 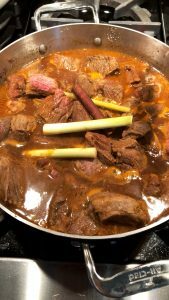 Next, add all the meat back into the large STOCKPOT (mine was 18 qt stockpot) and fill with water…add enough water to cover all the meat and other ingredients…I added mine until it almost reach the brim of my stockpot. Next, add ALL the vegetables and bring to a boil then drop the heat to medium-low to maintain a low boil…THEN add ALL the seasoning. 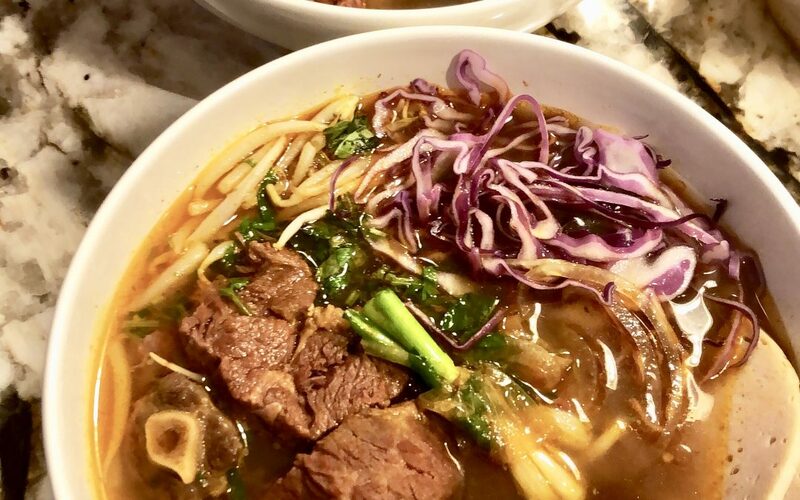 If you are using the Bun Bo Hue can…follow the direction on how much to add to your water/broth. Let it simmer and after about 4 hour remove the meat as they finish cooking. 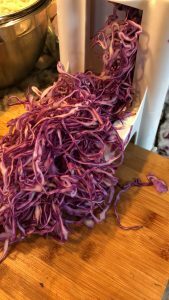 You don’t want the meat to be over cook because they will start to fall off and become very shredded. 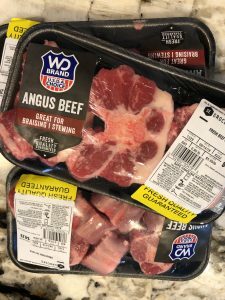 Let the beef shank and the chuck roast cool and you can slice them. I like to cube my chuck roast into 2 inch cube. Set all meat aside. Adjust seasoning and add water to the pot if necessary. Add more rock sugar, fish sauce or cayenne pepper (if you want it more spicy). Some people like to add shrimp paste during cooking time…if you decide to add shrimp paste…just remember that shrimp paste is VERY SALTY!!! So, a little goes a long way. Simmer for another 4-5 hours on low-simmer heat. Boil noodles according to package instructions. 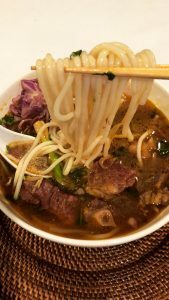 These BUN BO HUE noodle takes a little longer to cook then your regular vermicelli noodles. After about 8 hours simmering…you can start to serve. 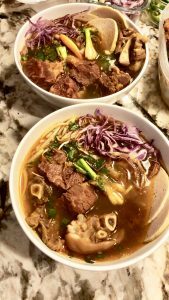 Assemble your bowl, add in your BUN BO HUE noodle..then add in the slices meat, ox tail, and pig tail. 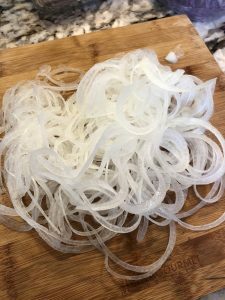 Next, add in your sliced pork patty and all your garnishes. 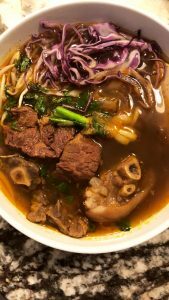 I like to eat my BUN BO HUE with a little shrimp paste. Ladle in the broth and season according to taste…add more fish sauce or shrimp paste if you like it more salty. Add in sliced jalapeno or chili if you like it more spicy. SIDE NOTE: I don’t add the shrimp paste to the pot because my husband doesn’t like the taste or smell…so I leave it out and add it to my individual bowl. ENJOY!!! Its so good when its SPICY! !